Having friends round to your house for multiplayer games is always fun, but the more there are, the smaller each player's screen becomes as they share part of the TV. Split even a big screen into quarters and the immersive effect is lost. But what if all the players had the same large screen? MirraViz have got it covered. The MirraViz projection screens are highly reflective but brightly reflect the light back in a tight cone, rather than scattering the light widely as a nomal white screen would do. When used with a video projector, this means that only someone sitting close to the projector sees the image. Think of the screen like a reflective street sign in the distance lit up by headlights: only the driver and passengers see the bright reflection from the sign. As light beams don't interfere with each other, the screen can reflect light back from multiple sources without distortion, so several projectors can be used with one screen. As a result, each player sees only their gameplay, but on the full sized screen. Whoa! It's kind of hard to imagine, but think of walking around in front of the screen. Only one gaming screen is seen at a time but as you walk round the screen changes between players. Don't worry, it takes Don a little time to get his head round it too. It's similar in concept to the old PlayStation TVs, except you don't need glasses to make it work. The screens are entirely passive - there's no electronics - and the video projectors don't have to be massively powerful because the reflectivity is so good. Personal or pico projects with less than a thousand lumens are fine. 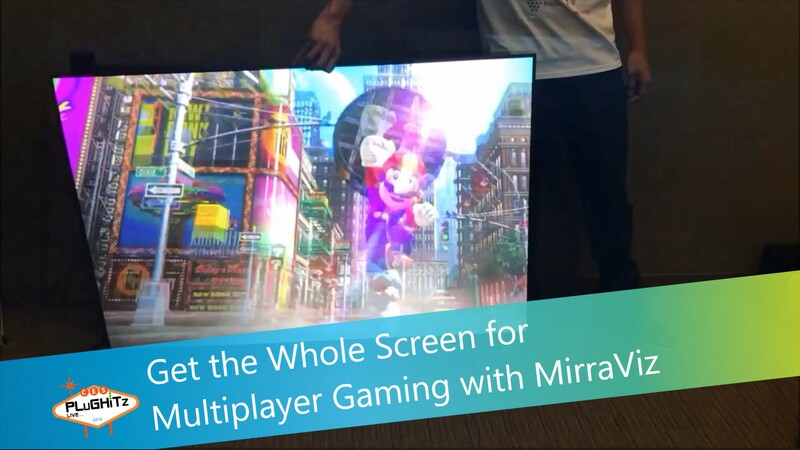 MirraViz sells combinations of hardware and screens for home entertainment or gaming setups, and they sell the screens on their own too. A 52" screen costs $699, 75" is $899 and 94" is $1299. They also offer full experience setups.